Moritz Dressel, a former Business Administration classmate from University of Twente, wrote the book Aspiring Advisor based on his experience as a management consultant within Deloitte. I was fortunate that Moritz was willing to sent me a copy of his book. The Aspiring Advisor’s subtitle is “strategies and tools for a successful consulting career” and I was really curious what leanings Moritz would provide, given the fact that we’ve both work for large multinational (consulting) companies. The Aspiring Advisor is divided in four major parts, that reflects your life cycle in a (consulting) firm. Throughout the book Moritz makes use of a simple theoretical project, where all relevant roles and actors are included. This approach makes it easy to see the practical relevance and implications of the theory outlined in the book. The first two chapters are covering what you can expect from the new consulting role that you will start in with company x. Furthermore you need to get ready and do some preparation for the first day at your new company. The topics vary from mastering communication by phone, e-mail and how to manage your time and meetings effectively. Expanding your professional network within the company is key for every professional, and you will find strategies to get an excellent performance review. Furthermore you can expect tips and tricks to stay ahead in your field of expertise and how to deliver great work for both external clients and internal customers. The four chapters are about the work life balance, why you need to focus on execution (not just thinking). Another chapter covers “saying no without ruining your career“. The final two chapters are about the question if and when you should leave the company, where Moritz Dressel provides a simple decision tree. And if you decide to leave the consulting company, than what actions are you taking. Leaving a company is not just writing a good bye e-mail to your colleagues. 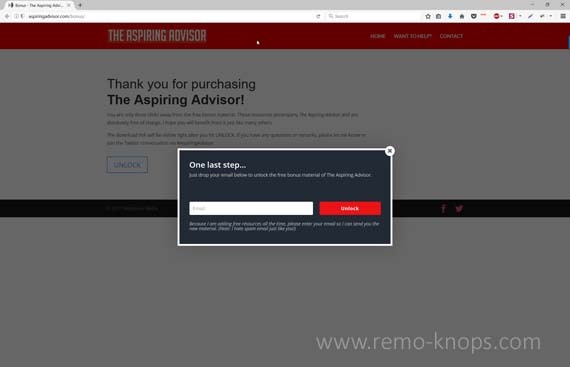 The Aspiring Advisor consists of many useful tips, models, insights and strategies. So let me highlight just a few so you will get an idea of what to expect. Moritz describes a standard process on p.63 of the book to follow when you produce any type of deliverable (no matter how small or how big the task is). The picture above shows the 10-step process, its different steps and some additional comments and required involvement of stakeholders. Confirm understanding and confirm approach are in my opinion important steps, since these are control points that the solution you deliver is in line with the expectations of the requester. In the example to transport someone from A to B you need to know if you delivery a flight or a bicycle as a proposed solution. Without understanding and confirmation on the approach expectations and solution might not be aligned. Occasionally I look at the different steps in the model, and see where I can improve application of the model in my day-to-day life. 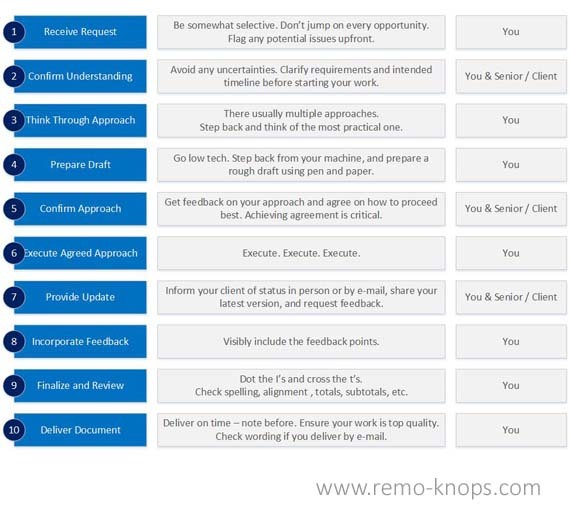 Presentation skills are required in almost every company and within a lot of roles. On p.68 Moritz Dressel describes a simple 6 step model to effectively build and deliver presentations. In addition I can also recommend Alexander Osterwalser’s Slideshare: Good PowerPoint Design – for business presenters (with on slide 46 the simple audience profiler). Personally I work a lot with Microsoft Excel and Microsoft Power BI building reports and insights. On p.74 there is a simple overview that describes Excel Model Maturity levels based on the complexity and target audience of the Excel workbook. It is good to understand who the target audience of the Excel model will be, and what level of understanding of the data or business context the audience has. Microsoft Outlook (as part of Microsoft Office 365) is the only mail-client on my laptop and Microsoft Surface Pro. And in a corporate setting e-mail is a very important communication channel. Moritz Dressel shares a few add-ons/plugins for Microsoft Outlook on p.91 of the book that he used. All the plugins below help you search Outlook or your Windows machine more efficiently. I wrote about another plugin, Xobni when it was launched for Microsoft Outlook back in 2008. Xobni was acquired by Yahoo in 2013. Moritz Dressel has a book companion site where you can find lot of background information, goals for the book, quotes of users as well as a preview of The Aspiring Advisor. Furthermore it is the place to be, to download the bonus resources, as the link is provided on page i. Please check out the website for more information on these Aspiring Advisor Kits. The Aspiring Advisor is an excellent work-book, and not just for junior consultants. It is an excellent source of knowledge and experience, that is well structured in a logical chronological way of your personal life cycle within a firm. From starting in your first days up to leaving the firm on a mature and professional way. I used the Chinese menu approach to consume the Aspiring Advisor, in other words I selected some chapters that got my attention and fast forwarded a few other chapters. However I used parts to reflect on my past years within Microsoft Consulting Services, from surviving the first week up to now. Make sure you visit The Aspiring Advisor book companion site for a free 85-page preview of the book or subscribe to useful online resources. Moritz, there are definitely useful pointers, tools and insights in the book, even when you are working in a consulting role for some years. I used some of the contents to reflect and repeat. 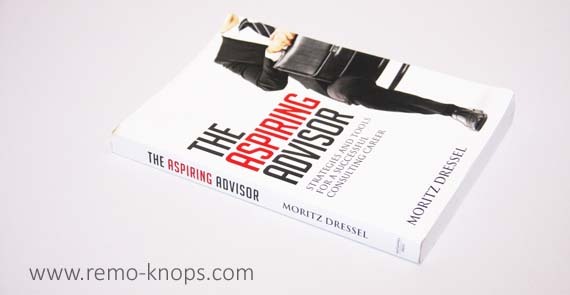 Hey!, I found this information for you: "Aspiring Advisor Book Review – Moritz Dressel". 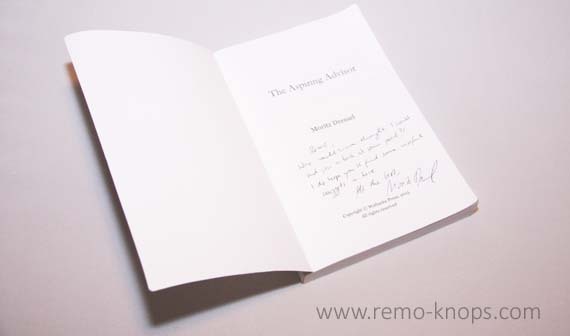 Here is the website link: https://www.remo-knops.com/5221/aspiring-advisor-book-review-moritz-dressel/. Thank you.